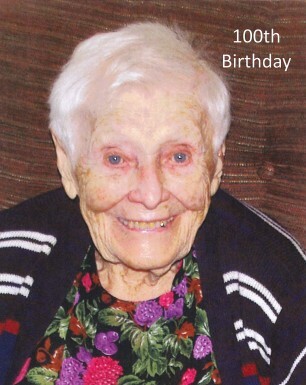 Eleanor Payerle of Calgary passed away at the Eau Claire Care Residence on January 17, 2016, at the age of 100. She was predeceased by her husband Leslie Payerle (2001) and is survived by his nephew Cornell, (Annie), of Vancouver Island. Predeceased by her brother John Veres (2014) she is survived by his widow, her sister in law and friend Elizabeth (Betty) Veres and Elizabeth’s sons David Veres, (Anne), John Veres, (Betty), William Veres, (Jill), George Veres, (Karen), 15 grand nieces and nephews including spouses, and 8 great grand nieces and nephews. Born in Semeny, Hungary, she immigrated to Canada at the age of 9 with her parents John and Rozalia Veres and brother John. The Veres family settled in Calgary. In her twenties Eleanor lived and worked for several years in the Payerle Brother’s Dairy and family business, in Armstrong B.C. Most of her life was spent in North Vancouver. She thrived there in a lovely home surrounded by gardens and returned to Calgary in 2003. Eleanor loved to cook and bake and enjoyed traditional Hungarian recipes into her 90’s. Her favorite hobby was the art of petit point and many of her pieces are in use today. Eleanor’s garden was her pride and joy. She loved to talk about flowers and looked at her photos all the time. A devoted wife and homemaker, Eleanor shared her life with Leslie for over 70 years. The couple lived in Greece for 4 years where Leslie worked on a new dam. Life long friendships developed during that time. Eleanor enjoyed reading and listening to radio talk shows into her 90’s. She enjoyed discussing politics, history, and current events with family into her 101st year. A favorite subject was her nephew David. She loved to watch Canadian football with her friend Lee and brother John. John was a source of great joy to Eleanor and he visited her frequently until his death at the age of 94. Eleanor’s family, who called her “Auntie”, and her cherished friends, will remember a beautiful woman blessed with 100 years of life. The Veres family is grateful to Dr. Davies and everyone at Eau Claire Care Residence and give special thanks to the staff on the 8th floor that cared for “Miss Eleanor”. A graveside ceremony will be held in the spring.